Q. How do I find books in the library catalogue? 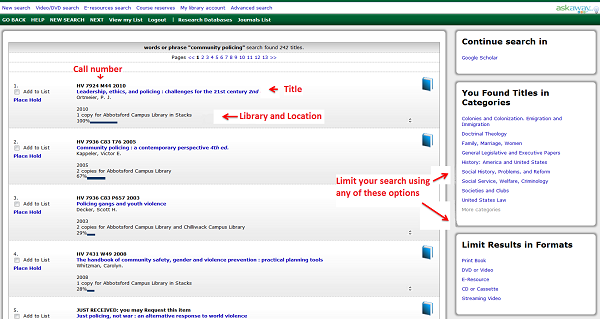 Enter your keywords in the "Find Books, E-books, and Videos" search box. If you are using two or more search terms you need to put an "and" in your search. You will get a list of items. They sort according to relevance. Over to the right you can limit your results to different types of material or different subjects. You need the call number to find the material on the shelves and you need to make a note of the location Stacks or Reference. You can limit your search to materials on a specific campus by changing the Library box from "ALL" to Abbotsford, Chilliwack, Mission, etc. Use "Advanced Search" to do more specific searches, such as searching for an author's name and book title at the same time, or limiting by publication year.